Electric cars and taxis are fine around town, but they won’t allow long distance travel. One option is to use trains and buses for long journeys, but sometimes you need to take stuff with you – luggage, boats, children, dogs, and all their clutter. This page looks at whether we could still have cars like those today, but with no carbon emissions. It also looks at what they might cost. Liquid fuels like petrol and diesel are great. They store lots of energy – much more than a battery of the same weight. That’s why a car can be so powerful and travel so far. Liquid fuels are dead easy and quick to buy, and when you have bought them they are dead easy to store in a tank, for weeks on end. It would be great if we had a renewable liquid fuel. What makes a fuel renewable is the way you make it. Our low carbon sources of energy generally produce electricity. We also have access to biomass – discarded plants stems, food waste, wood. We can also generate heat directly from the sun. Electricity, biomass, and heat need to be our starting point. Our cheapest large scale form of renewable electricity is probably solar panels in a desert. The deserts are big, there are not many clouds, and the sun is hot. Deserts tend to be near the equator which means output in winter and summer are not too different. Solar panels are getting cheaper and given an order for say 1,000,000 square kilometres, which is the sort of size that would be needed, they would hopefully get cheaper again. Sadly the sun only shines during the day, so these panels produce an intermittent output. The power drops off when the sun is low in the sky, and is zero all night. There are other solar technologies that get round this problem but they aren’t cheap so before we go that way we should try to do something with this intermittent output. One thing we can do is use it to electrolyse water, which splits it into hydrogen and oxygen. Some energy is lost in this process. The kit to do the job is called an electrolyser and costs money to buy and maintain. It would be more economical to operate the electrolyser continuously but if we use simple solar panels that is not an option. The hydrogen from the electrolyser isn’t a liquid fuel, but it can be used to make liquid fuels. For this exercise I’ll assume the liquid fuel is methanol. Methanol is the fuel they used in Indy cars until a few years ago. There are known processes for making methanol from hydrogen and biomass. So that’s it. Modify the cars to burn methanol, ship methanol instead of oil, and hey presto there is a convenient, low carbon, liquid fuel. For practical reasons 85% methanol is preferred and it needs a few other things mixed in but they can also be produced sustainably. 1. What will the electricity cost? There are all sorts of differing views about the future costs of solar electricity. For this study I calculated a cost of US$ 0.137 per kWh. To calculate that I assumed that the capital cost would be recovered over 10 years, and also assumed a maintenance cost of 10% of the capital cost each year. 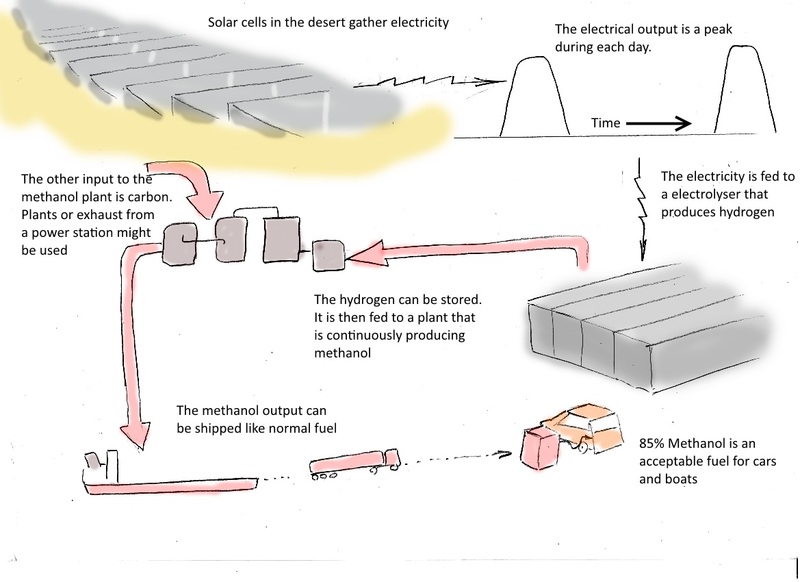 I assumed a 25% capacity factor and a $1,500 per kW ($1.5 per watt) installation cost, which seemed sensible for utility scale construction in the desert (country sized blocks of solar panels will be needed, so economy of scale should have some effect). 2. What will the hydrogen cost? This depends on the cost of electricity, the efficiency of the electrolyser, and the capital cost and maintenance costs of the electrolyser. I assumed that the electrolyser would need 70kWh of electricity to produce a kg of hydrogen, which seems typical for large scale electrolysers (56% HHV efficiency). I assumed that the electrolyser would cost $850 per kW, from ref 1. I assumed a payback of 10 years, and maintenance costs of 10% of the capital cost, per year. On that basis I found hydrogen costs of $15 per kg, which is much higher than current costs based on production from fossil fuels. 3. What will the methanol cost? One kg of hydrogen is sufficient for 10 litres of methanol at 100% conversion, or probably 8 litres at a practical conversion rate. The conversion requires a source of carbon and oxygen, the remaining constituents of methanol. The route appears to be established and the equipment less challenging than for the stages up to methanol. At this stage equipment can be operated continuously. The input cost of the hydrogen for a litre of methanol is around $2 per litre, so an output cost of $2.5 per litre seems sensible. 4. Distribution costs of methanol should be similar to petrol or diesel. Since the pre-tax cost of petrol is only around $.65 per litre I guess that the distribution cost can’t be more than about $.3 per litre. 5. The overall cost of methanol, without any tax, should therefore be very roughly $2.8 per litre, or to reflect the vague assumptions somewhere between $2 and $4 per litre. It seems fair not to tax this product since it is pollution free. That compares with about $2 per litre in the recent past in the UK for petrol, a rate which did not seem to suppress demand significantly. Petrol and methanol aren’t equivalent litre for litre – more methanol will be consumed per mile, so methanol will work out at somewhere between 20% and 120% more per mile than UK petrol in 2013. The conclusion is that this fuel will be perfectly affordable for many leisure activities. For most people its extra costs at the weekend will be balanced by the fact that most journeys during the week will be in battery electric vehicles with reduced energy costs. Country dwellers, who may not be able to use batteries for reasons of range, will probably need some special help if they are to decarbonise their transport. If you have better data, or think I’ve got this wrong, please get in touch. Ref 1 – NREL/TP550-44103 December 2008. Wind to hydrogen project – Electrolyser Capital cost study – Genevieve Saur. Ref 2 – Methanol as an alternative transport fuel in the US – Bromberg and Chang – Final Report – November 28 2010.